This stew was an innocent dinner last week. I saw my friend Leanne post a photo of this stew on her Instagram feed and it looked delicious, vegan, flavorful, easy, everything I like and the way my family eats. She mentioned she found the recipe in the NY Times. Well, what she didn’t tell me was that it was Alison Roman’s recipe for the NY Times and it had its own hashtag #thestew. Who knew??!! And I can see why this recipe has been trending. It was super good and really pretty. Pretty dishes get all the love these days. But I will vouch for this recipe that it’s not just a pretty face. There’s substance to this stew and it’s pretty healthful. We’re still struggling in LA with unseasonably cool temps, so soups and stews have been my life this winter. I especially appreciate the warming nature of ginger and chili flakes. There’s a good chance you have all the ingredients to make this in your pantry/fridge. I have been growing herbs on my patio, so I was quite delighted to use my fresh mint here. I have been deviating from recipes lately and instead using what I have or adapting the ingredients to what is seasonally available. The green curly kale was my favorite part of this stew, believe it or not. The ridges on the edge of the leaves picked up so much stewy goodness. But I could see adding asparagus, broccoli, green beans, or snap peas. I hope this recipe is not in your repertoire yet and that I’m bringing you something new. If you make it and post it, use the hashtag #thestew and tag me so I can see your beautiful creations @pamelasalzman. Enjoy! Heat the oil in a large pot over medium heat. Add garlic, onion and ginger. Season with a big pinch of sea salt and pepper and cook, stirring occasionally until onion is translucent and starts to brown a little around the edges, 3 to 5 minutes. 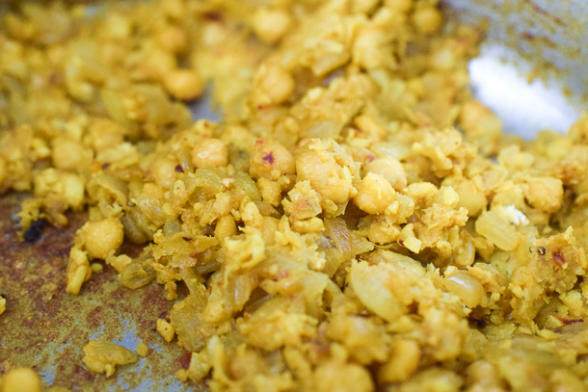 Add turmeric, red-pepper flakes and chickpeas, and season with salt and pepper. Cook, stirring frequently, so the chickpeas sizzle and fry a bit in the spices and oil, until they’ve started to break down and get a little browned and crisp, 8 to 10 minutes. Remove about a cup of chickpeas and set aside for garnish. Using a wooden spoon or spatula, further crush the remaining chickpeas slightly to release their starchy insides (this will help thicken the stew). Add the coconut milk and stock to the pot, and season with more salt and pepper. Bring to a simmer, scraping up any bits that have formed on the bottom of the pot. Cook, stirring occasionally, until stew has thickened and flavors have started to come together, 30 to 35 minutes. 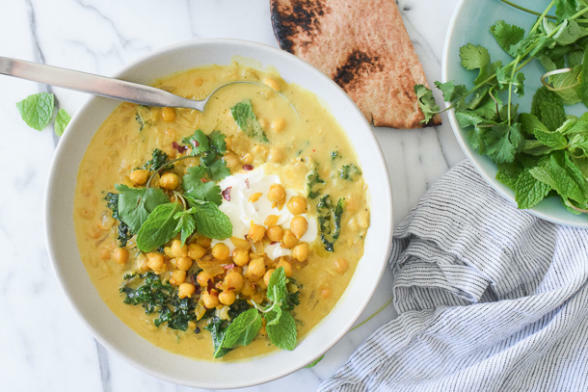 (Taste a chickpea or two, not just the liquid, to make sure they have simmered long enough to taste as delicious as possible.) If after 30 to 35 minutes you want the stew a bit thicker, keep simmering until you've reached your desired consistency. Determining perfect stew thickness is a personal journey! Add the greens and stir, making sure they’re submerged in the liquid. Cook a few minutes so they wilt and soften, 3 to 7 minutes, depending on what you’re using. (Swiss chard and spinach will wilt and soften much faster than kale or collard greens.) Season again with more salt and pepper. 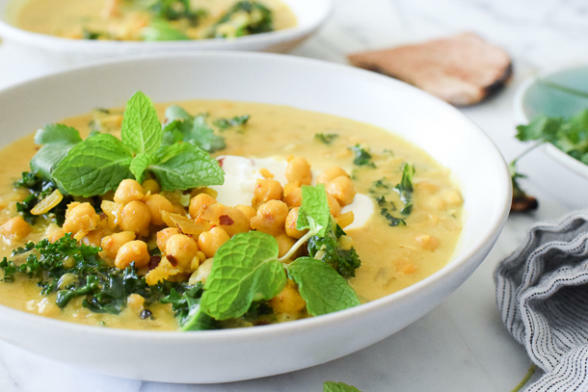 Divide among bowls and top with a dollop of yogurt, mint, cilantro, reserved chickpeas, a sprinkle of red-pepper flakes and a good drizzle of olive oil; dust the yogurt with turmeric if you'd like. Serve alongside toasted pita if using. *Personally I thought the ratio of coconut milk to stock was a little rich. I prefer it with a little less coconut milk, like 1½ cans, and more vegetable stock, like 2¾ cups. This was not in my repertoire and it’s so so good! I might have to eat another bowl! Thank you!! Hi – love your site (and have your book!). This stew sounds delicious but I need to avoid saturated fat (coconut milk) and dairy. I realize the coconut milk is integral to the recipe – is there a substitution that could work? Thank you! Thanks! I’m really not sure since I haven’t made it any other way. 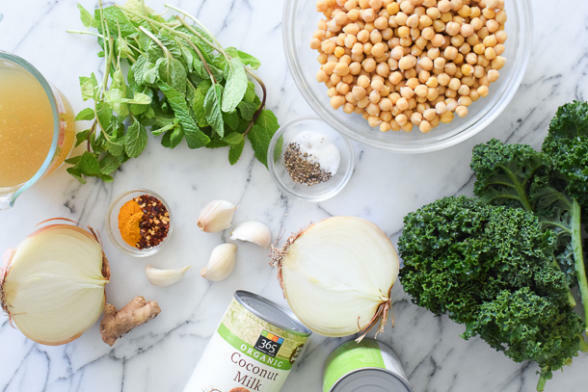 But I have a feeling you could try some cashew milk or hemp milk and puree some of the chickpeas into the stew to thicken it that way….